Internet speculation vs First hand experience….. In the last few days, A guy on the West Coast named Alan Laudani, who has questions about his running Corvair engine, went on the Corvaircraft Internet Discussion Group and wrote a story about his engine failing to turn enough RPM with a ground adjustable prop set at a very high pitch setting. He received a lot of speculative “advice” from people who have never seen the engine in question, and in all likelihood have never met Alan. Ed Lee said the cam timing might be wrong and said he was certain it should turn more rpm because his much smaller wood prop does……..
Mark Langford gave an example of a person with the wrong cam in his engine, referenced a computer predicted result, and suggested the engine be tested with a known prop previously run on the same size Corvair. He went on to suggest running the engine without a prop to check the timing, because it was ‘less risk to life and limb’……. Roy Szarafinski said several things, but suggested checking the compression, he went on to suggest the mixture could be very wrong on the motor………. Earnest Christley chimed in to suggest a compression check, asked if there was a lot of blow by, and went on to speculate that it had the wrong head torque, and Alan should seriously look at the possibility that the engine has broken piston rings………..
Somewhere in there Dan Weseman, pointed out that the engine had been run already at a Corvair College, ……but this comment was ignored by the speculators who had never seen the engine, but were sure they knew it had something wrong. Notice how quickly they escalate to ‘broken piston rings’. Above, a picture I took myself, May 9th 2016 in Cloverdale California, where the engine in question had just been run on my test stand. Unlike the people on the discussion group, I had seen the engine run in person, and had worked directly with Alan. I even documented it on my website. 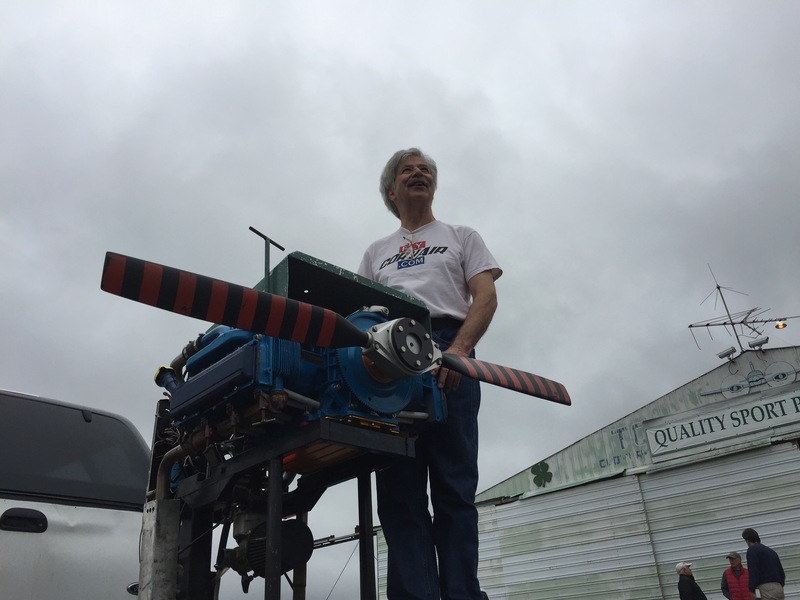 The picture is Alan standing beside his engine just before the run. Read the story: Alan Laudani 3,000 cc runs at CC #38, and in case you think it is a hoax, read the Comments also, where Alan includes his email address and thanks several people, including myself and Jerry Price for working on the engine. I’m kind of wondering why Alan went to the internet to find strangers to comment on his engine instead of contacting myself or Dan, and I’m really wondering why he failed to mention to anyone on the net that I had driven all the way from Florida on a 7,200 mile circumnavigation of the US, and Alan’s engine, and all the others on the trip, were run at for free at the events. Evidently he values the speculation on the net over direct in person assistance. I ran the engine myself and it was in fine working order. The cam timing was not wrong, I can spot this in an instant by watching the motion of the #1 intake rocker and looking at the timing mark on the balancer. The warp drive prop on Alan’s plane can not be compared to the wood props mentioned. The diameter of the Warp prop will not allow it to turn the rpm of a 54″ wood prop. The engine was run with the prop pictured, my test prop, which has run more than 300 Corvair engines in the last 14 years. ( It has been repainted, but it just ran 4 more engines last weekend) I always have an optical tach, my $79 Equis timing light has a built in digital tach, and after 300 engines on the same prop, I can usually call the rpm of a Corvair plus or minus 35 rpm by sound and throttle position alone. ( If you want to lose $100, bet me I can’t do this at the next Corvair College). I have said this countless times, no Corvair should be run without a prop. There is no cooling, but more critically, the prop is the ‘governor’ which prevents the motor from hitting 7,000 rpm in the blink of an eye. I can also tell the compression of a Corvair by turning the prop over by hand. In setting an engine up on my stand, I always do this, and after hundreds of them, it is easy to tell by turning the prop if each individual cylinder has compression. Also the suggestion the motor might be running with the wrong mixture comes from the very person, who along with Ron Lendon, caused this mess: Safety Alert: Excessively Rich MA3-SPA Jetting..
All engines run on my stand are observed for blow by out the vent tube, 15 years ago I did extensive volume measurements by timing the flow to inflate a 30 gallon trash bag. I an say that Alan’s motor had completely normal blow by for an engine breaking in. There is no way, short of heads so loose it didn’t squeeze the gaskets, that low rpm could be caused by head torque. Know this: an engine with a blown head gasket will make more than 90% of the rated static rpm. Leak down has very little effect on static rpm. ……and let me add that it 29 years of doing this, I have had an occasional builder break a ring putting the piston in a bore, but never, not once, have I ever had a builder break any piston ring on the test run, not once in hundreds of runs. OK, so what is wrong with Alan’s motor? Simple, he is using a junk tach, that he says in his post will not even read above 2,000 rpm, additionally he mentions trying to run it directly of his MGL “glass cockpit” although I have very specifically warned people to NEVER do this: MGL vs Corvair ignition issue. In short, Alan has no idea what rpm his engine is turning. He could just use a cheap timing light to get real numbers, but he would rather short out his ignition by wiring it to a South African “Glass Cockpit” maybe time to pay attention to basics and buy a timing light. Spending thousands of dollars on an imported screen that has a notorious ability to hurt ignitions, and then trying to run a junk Westach tachometer is an example of poor decision making. Alan started out with a ridiculously high pitch setting, and now is trying a ridiculously low one. I would have told him this if he bothered to call. Hey William, if you have all the answers, why don’t you go on Corvaircraft and set Alan straight? Simple, I have been banned from posting anything on Corvaircraft for the last seven years, because clearly, people who offer random speculations on a motor they have never seen are offering much better education and service than myself, who drove all the way across the US and ran the guys engine for free. I must be the major impediment to anyone getting their engine running. Yes, Al Gore invented the internet and gave everyone an equal size soap box to speak from, and that made the world a better place, where the average of the speculation is always a better answer than just asking the guy who ran this specific engine and a few hundred others like it. If anyone just started looking at Corvairs on the net, and read the exchange about Alan’s motor, what conclusion would they come to? Does it accurately portray my service to builders or my understand of the engine or my willingness to share this with builders? I think not. I’m actually looking forward to hearing if Alan ever goes back on Corvaircraft and tells people why he failed to mention his engine running on my stand and why he let others speculate on an engine he had already see run correctly. For builders with actual plans of being honest and learning something, you can always call my cell phone 904-806-8143. On this Memorial Day I would like take a moment to share a bit of wisdom from my father, William E. Wynne Sr. 1925-2017. Above, 1967 photo from Vietnam, my father is second from the left. The aircraft is a C-123 Provider. First, as most members of the armed services will remind us, and the public has mostly misunderstood, Memorial Day is not Veterans Day, it isn’t for thanking those who have served, it is intended to be a day of remembrance of all the Americans who lost their lives, and everything they might have ever done on this earth, in service to our Country. My father spent the years 1943-76 on active duty and last year he has laid to rest at Arlington, but he was no militarist. He very rarely spoke of his views outside the family. He had one personal value that I’d like to share here: He adamantly believed that no American should express an opinion on a conflict until they have memorized the name and personal story of at least one fellow citizen who lost their life fighting in it. My father lead by example on this, and even when he was ninety, the could, given an hour of your time, tell you the names of 100 people who paid a terrible price and should be remembered on Memorial Day. If the number seems exaggerated, I can assure you it isn’t . WWII provided him with a somber start, as it took the lives of several dozen of his high school classmates, 23 in a single day. My fathers strongest bond to service was born of his years in the Seabees. Perhaps for this reason, he selected the name and story of Marvin G. Sheilds for me to learn. By the time I was nine I could share a brief biography of Shields. If you are among the Americans who cannot name a single person lost in Vietnam, perhaps spend 10 minutes of this Memorial Day reading his Wikipedia page and find out how his this man’s name became engraved on panel 2E of the Wall in DC. If there is a particular American who died wearing the uniform of our country you wish to be remembered today, please take a moment to share their name in the comments. 2,850cc Corvair for Zenith 650, James Siebenaler. The fourth engine to run at our joint FlyCorvair/SPA Panther workshop/Open house was built by Jim Siebenaler for his Zenith 650. He had just relocated from Ohio to the Florida panhandle a few weeks before, including buying a new home and moving the project, in addition to family stuff, but Jim made the choice to take advantage of the event, and not put off a chance for progress and good times. The reward for this decision is evident in the photos. Above, Jim’s 2,850cc Corvair running on the stand. It started instantly and layed down a perfect break in run, the only adjustment we made was to tighten one oil line fitting 1/16 of a turn. Not bad for a motor which was built in its entirety in 2 modest days work at the event. This was possible because Jim did his homework before arriving, he coordinated with SPA to make sure he had every part, he followed the new SPA Assembly Manual step by step, and he wrenched in a relaxed but steady pace over the two days. Above, Dan and Jim check out the motor as it runs. This is typical of the more relaxed setting we have at events like the Workshop and the Finishing Schools we have run at the SPA/Panther factory. We will always have Corvair Colleges, and I love them, but some people like a slower pace and a smaller setting, and the workshop served this. It is the middle ground between a full on Corvair College and scheduling a personal build and run at my hangar. Jim worked with us for nearly a decade, yet this was the first event he was able to attend. There is good reason for this, He spent more than three decades in service to our country, and has only recently retired. He has logged more than 3,400 hours in rotary wing aircraft, including flying the latest models of CH-47 Chinook in war torn parts of the world. It was service and family first, but he carefully planned and made progress where he could. The test run was a tribute to his strategy of persistence. To understand how this vital element is embedded in every aspect of our work, look at this story: The Vindication of Persistence. If you look at the photo, you will notice the motor has the most up to date 2400L starter on it. It also has a SPA billet crank in it and many other options which came along in the last decade. Jim didn’t restrict himself to building a 2008 motor because that ways the year he got started with a manual and a core. He wisely chose to take advantage of all the things we have learned and updated. There is noting wrong with motors as we assembled them in 2008, and there are plenty of them in service flying every week, but Jim made the chose to have a fully up to date motor, and take advantage of all the information we can share with him. Above, Jim gives his take on the “Captain Morgan Pose”. That smile is provided by having the accomplishment and satisfaction of a perfect break in run of a motor built with his own hands, an engine he now understands very well. A day will arrive when this plane takes to the air later in the year. It will arrive because Jim didn’t blow off opportunities to learn, make progress, and have a good time. When you read about upcoming events, keep in mind they are all opportunities to advance your own project, to make sure that you also will have a day where your own aircraft takes to the sky. The only thing this requires is your personal decision you will not keep putting off your own goals for a ‘some day’ which will never come. Corvair Core engine needed in St. Louis area. I have been speaking with Dan Noble for the last few weeks as he had been looking for a core to rebuild for he upcoming Zenith project. 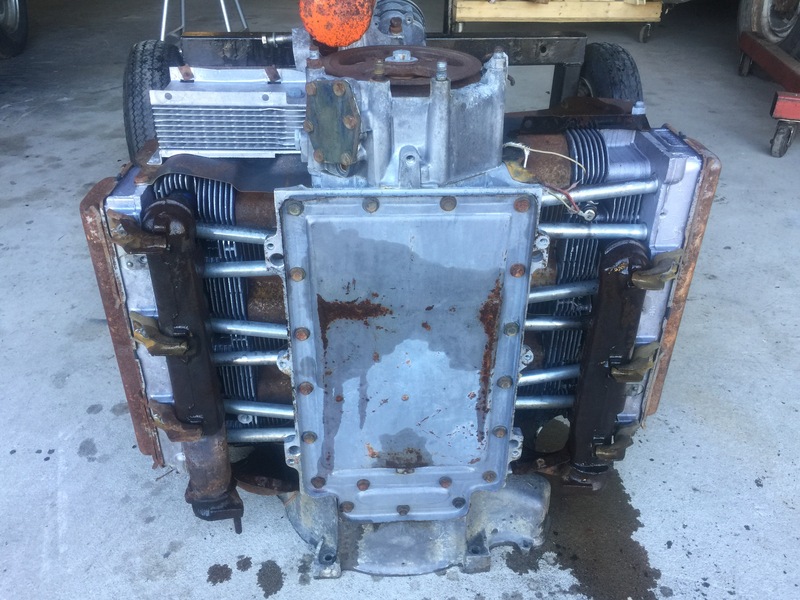 He is really Gung-ho on this, but somehow the ironic sense of humor in the universe keeps showing him guys who live 6 hours away who want $500 for seized motors missing heads. I told him if something better didn’t turn up, I would put the word out here, and I predicted positive results, so lets see if a builder out there can get Dan a lead on a core in his area and prevent me from looking bad. If you know anyone who has a spare core within a few hours of St. Louis which meets the standard of 1964-69, 95 or 110, and rotates 360 degrees, please do me a favor and give Dan a quick call or text. He is a good guy, someone we want in our builder community. I really like his attitude, because he told me that he is going to build either a 650 or a Cruiser, which ever appealed to his wife, all he specified is that it is going to be Corvair powered. PS, if the guy who provides the intel which get Dan a core shows up at my Oshkosh display, I will buy that builder dinner as a thank you for showing community support on this. -ww. Judging a book by it’s cover story: When engine shopping, I don’t care if the engine is clean, only if it rotates. Counterintuitive Grease Monkey Experience: an engine that is covered in goo on the outside constantly leaked oil, and thus had a continuous oil change going on. This motor invariably looks better inside than one which drove the last 3 or 4 years without an oil change. Besides, an oil leak core motor began the “self cocooning” anti-exterior corrosion process before hibernating a few decades waiting for you to need a flight engine core. 3,000cc Corvair for 750 STOL, David Koshinski. Here is a look at the 3rd engine that ran at the joint Flycorvair/SPA Panther workshop open house. It belongs to David Koshinski, and he is installing this on his Zenith 750 STOL. Ok, get a good look at his smiling mug. This is the face of a very happy man. What produces this expression? The satisfaction of having an engine that you built with your own hands, an engine you really understand, lay down a perfect break in run. This is what the very core of traditional homebuilding is all about. The fact that David had this accomplishment in the company of other like minded builders, and with the direct support of the two companies that guided him through the process makes it all that much sweeter….. Contrast the image above with this story: A week before this event, I received an email from a guy up north, someone who has met me in person, which basically said he had looked on Google earth and seen the address of the Panther factory was in an industrial park, not directly on an airport, and from this, he come to the conclusion that the event wasn’t real, and he canceled his plans to attend. * If you don’t recognize the quote above, go to Youtube and search “Dr. Strangelove – Precious Bodily Fluids” for a glance at one of the greatest Aviation movies ever made. 3,000cc Corvair for a Panther; Chris Michaelis. The second engine to run at the joint Flycorvair/SPA panther workshop belongs to Chris Michaelis, a Panther builder from Maryland. He started the assembly at a previous Barnwell SC Corvair College, but he got in the car and drove down I-95 to take advantage of this past weekends event. It was a good choice, because his engine put down a perfect break in run on my test stand. Above, Chris’s 3.0L Corvair, a virtual clone of the one Dan Weseman selected for his prototype Panther in 2012, ( read: Why Not the Panther engine?.) It put in a perfect run. It started in 2 seconds of cranking, and we proceeded to run it for 35 minutes. It required no adjustments nor corrections. This engine will not need a valve adjustment nor having the heads retorqued for it’s entire lifespan. If that doesn’t sound like an important indication of good engineering, you are not yet aware that engines like the Jaibru 3300 require these things to be done every 25 hours of the engines life. I don’t change the oil on Corvairs that often, far less break out a torque wrench. The ironic element of the above paragraph is this: Because we run an education and training based program, many new people falsely assume this means that Corvairs need constant fiddling. I have actually had a person shopping for a motor for his Zenith look at my conversion manual and say “I don’t want an engine I will always be working on, I’m going to get a Jaibru. ” I actually tried to explain what he was missing, but he already made up his mind contrary to all evidence. The engine promoted by the grease monkey from Florida must be a lot more work because he wrote a book about it. Fortunately most people possess slightly better critical thinking skills. Above, Dan, holding an infrared temperature gun explains a concept to Chis and Jimmy Mathis. (That is Rachel off to the side) The smaller size of this workshop allowed many more moments of direct instruction like this. It was very rewarding for both instructors and builders. You are looking directly at the transfer of experience and understanding which is at the very core of homebuilding. Chris really is a rocket scientist Phd engineer who works for our national space program. In person he is a relaxed fun guy. Here is how casual he was about supervising his test run outside the front door of the SPA/Panther factory. Later on I was kidding him about expecting to see a lot of equations in his notebook and instead finding doodles of Will E. Coyote opening making crates from ACME marked ‘handle bars’ and ‘Rocket motor’. Chris is a quality human being. 14 months ago we held Corvair College #39 in SC, and Chris was there. On the last hour of the college a builder there had a terrible medical emergency, and we took him to the regional medical center in Aiken. You should take a few minutes to read the story here: Builder Medical Emergency Update. The man was 700 miles from home, had no family and limited resources. after 12 hours in the hospital, he took a hard turn for the worse. Two dozen Corvair builders offered to assist and made contributions to the effort that eventually got the man home, but I can single out one person, Chris Michaelis, as the hero of the story. He dropped everything he was doing and stayed for a number of days in Aiken, and we spent most of each day by the man’s bedside. While I tried to remain upbeat, it was very hard to watch a man struggle to retain some small facet of his health and identity. A number of times I had to walk out in the hall and stare out the window to collect myself. Through several days of this, Chris never once had the smile leave his face nor fail to comfort the man in the bed. It was an outstanding display of personal strength and generosity of spirit that moved me beyond words. 3,000cc Corvair for Bearhawk LSA: Jimmy Mathis. Friday was the first day of our Flycorvair/SPA Panther joint open house – workshop. The first engine to hit to test stand was Jimmy Mathis’s 3,000 cc Corvair which will power his Bearhawk LSA. Jimmy and his lovely wife drove in from Texas, about 900 miles for the event, this was the furthest distance traveled of any of the builders who attended. His engine put down a flawless break in run. Look at the photos; This is the best of homebuilding, high achievement as the result of hard work and exercising newly acquired skills, all done among like minded friends. Above, Jimmy and his lovely better half. His engine is a 3,000cc Corvair which well be installed in the Bearhawk LSA he is building. There is a real satisfaction to building your own power plant, and really understanding it inside and out. The builders who get the most out of what we offer are the ones who take advantage of all the skills knowledge and understanding we share. Above, Dan Weseman and Jimmy go over timing light operation. 13 years ago I developed the modern Corvair E/P (electronic/Points) ignition, and over the years have made several hundred of these units. They have a near flawless record of service, there has not been a single forced landing attributable to the design. In a given year, perhaps 90% of the flight hours logged on Corvair powered planes in the world are accomplished with an ignition system I built. For all these years, we have also offered free direct hands on training at more than 40 Corvair Colleges and countless forums, workshops and finishing schools. The system is far easier for an amateur builder to understand and utilize than traditional magnetos, and it costs perhaps 1/3 what a pair of mags for an O-200 does. Unlike other alternative engines, the system is designed from inexpensive off the shelf automotive components. It contains no proprietary subcomponents. Above, a great family photo. Look at the smile, Jimmy is a fortunate man to enjoy full support on the home front. Get a good look at the motor, it is built straight from our manuals, parts and guidance. Jimmy’s engine will offer many, many years of reliable service because he chose to follow the path that Dan Weseman and myself have long proven. He didn’t look to the net and people with mystery online names for advice, he just went with two people who know what they are speaking of. What sets Corvair builders apart from most people in homebuilding? Read this an understand what motivates many builders like Jimmy: Thought for the Day: Mastery or?.